Matt. 5:1-12 In the spring of 28AD, Jesus goes up onto a hillside overlooking the northern shore of the Sea of Galilee (see Map 7). He uses a natural amphitheatre above the lakeside to address the crowds who have gathered from Galilee, Jerusalem, Judaea and the Decapolis (the ten towns on the eastern bank of the River Jordan). His teachings become known as the ‘Sermon on the Mount’. Blessed are those who are humble before God for they will enter the kingdom of heaven. Blessed are those who are saddened by immorality and dishonesty for they will be comforted by the Holy Spirit. Blessed are those who are compassionate and forgiving for they will realise that the whole world belongs to God. Blessed are those who hunger after honest and sincere relationships for they will have all their needs met. Blessed are the merciful who forgive others for God will forgive them. Blessed are those with pure motives in their heart for God will be their inspiration. Blessed are the peacemakers for God will welcome them into his family. Blessed are those who are persecuted as a result of being honest for they walk in the ways of God. These eight ‘blessings’ have become known as the ‘Beatitudes’ (from the Latin for ‘blessed’). Jesus’s teaching of the Beatitudes was commemorated at the end of the 4th century by a small Byzantine chapel built beside the main road at En Tabgha near Capernaum. This chapel and a small adjoining monastery were abandoned in the 7th century. The remains of a Byzantine mosaic floor from the chapel can be seen on display at Capernaum (see Map 7). 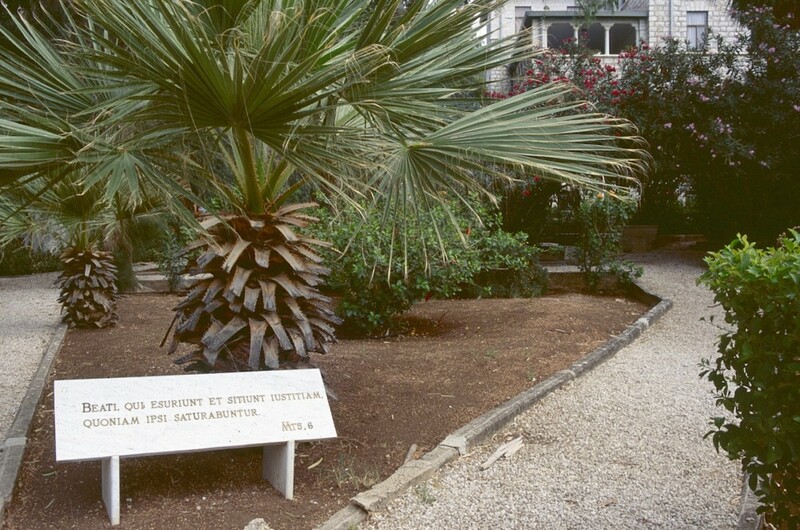 The hillside where it is believed that Jesus preached the Sermon on the Mount and taught the Beatitudes – overlooking the Sea of Galilee above En Tabgha near Capernaum – is now occupied by the modern Church of the Beatitudes, built by the Italian Franciscan architect Bertalucci in 1938. The octagonal shape of the modern building reflects the number of blessings taught by Jesus. The eight ‘blessed’ sayings are inscribed (in Latin) on a series of plaques in the attractive gardens surrounding the church. On the slope below the Mount of Beatitudes, above the lakeshore between En Tabgha and Capernaum, a wide natural hollow is thought to be the place where Jesus often taught parables such as the Parable of the Sower to the large crowds who flocked to hear him. The excellent acoustics of this natural amphitheatre have led to the area becoming known as the Sower’s Cove. Matt. 5:13 Jesus tells the crowds, “You are the salt of the earth. But if the salt loses its salty taste, it cannot be made salty again” (Matthew 5:13). Salt was highly valued in former times as a preservative as well as for flavouring. Salt that loses its saltiness may refer to salt from the south west corner of the Dead Sea. The Dead Sea lies on the floor of the Jordan Valley (see Map 1 & Fig 1). At 1378 feet / 420 metres below sea level, it is the lowest point on earth. The water in the Dead Sea is very salty because rivers, such as the River Jordan, carry dissolved salts into the sea but there is no outlet. Consequently, as the water evaporates due to the high temperatures, what liquid remains becomes exceptionally salty. On the southern shore of the Dead Sea, the water was completely evaporated in salt pans, while the remaining salty deposits were shovelled into heaps or ‘pillars’ of salt in order to dry (see Genesis 19:26). Because of impurities and chemical changes, the outer layer of the salt had to be discarded because it had lost much of its salty taste. Matt. 5:14-16 Jesus tells his followers, “You are the light that gives light to the world. A city that is built on a hill cannot be hidden” (Matthew 5:14). There are many hilltop towns in Samaria and Galilee. Safad, for instance, situated on top of a hill to the north west of Capernaum is clearly visible from the north west shore of the Sea of Galilee. When lamps are lit in the houses at night, they can be seen from a great distance and cannot easily be hidden. Matt. 5:17-37 Jesus teaches that he has come to fulfil the prophesies in the Jewish scriptures (the ‘Old Testament’). He says it is useless to make an offering aiming to put things right with God unless you have first put things right with your neighbour. He speaks against immorality, lust, divorce and swearing. Matt. 5:38-48 He urges a peaceful resolution to disputes. “You have heard that it was said, ‘An eye for an eye, and a tooth for a tooth’” (Matthew 5:38) (see Exodus 21:24). In contrast, Jesus advocates ‘turning the other cheek’. “If someone slaps you on the right cheek, turn to him the other cheek as well” (Matthew 5:39). And if a Roman soldier forces you to carry his pack for one mile (the maximum permitted under Roman law), “go with him two miles” (Matthew 5:41). The Jewish law taught people to love their Jewish neighbours (see Leviticus 19:18). But Jesus added, “love your enemies. Pray for those who hurt you” (Matthew 5:44). Matt. 6:1-18 Jesus teaches his followers how to pray to God. Believers should pray using simple words and without any ostentatious display. Jesus offers a ‘model’ prayer – which has become known as ‘The Lord’s Prayer’ (see the feature on The Lords Prayer). Matt. 6:19-34 Jesus urges his followers not to worry about the future. “Don’t store treasures for yourselves here on earth … But store your treasures in heaven where they cannot be destroyed...”. Jesus is indicating that God is preserving these ‘treasures’ until the time comes when he renews the whole of creation (Matthew 6:19-20). “Look at how the lilies in the field grow. They don’t work or make clothes for themselves. But I tell you that even Solomon with his riches was not dressed as beautifully as one of these flowers” (Matthew 6:28-29). Galilee has ample rain during the winter, so the hillsides are covered with a multitude of wild flowers when Jesus talks to the crowds in the spring of 28AD. Matt. 7:1-23 Jesus teaches his followers not to judge others, “or you will be judged” (Matthew 7:1). He tells them to expect good gifts from God. If they give willingly to their children, “How much more your heavenly Father will give good things to those who ask him!” (Matthew 7:11). Jesus warns that it is necessary to stick to God’s path in order to gain eternal life, for “The gate is wide and the road is wide that leads to hell” (Matthew 7:13). He warns people not to be led astray by those who do not tell the truth. These ‘false prophets’ will be recognised by their ‘fruit’ – their dubious lifestyle that is not in keeping with God’s ways. Matt. 7:24-27 Jesus tells a story about two very different people who build their faith in God on what they hear. They are like two housebuilders – a wise man who builds his house on solid rock and a foolish man who builds his house on sand. Sand is loose and unconsolidated, and any house built on it can easily be washed away by a heavy downpour. Rock, on the other hand, is resistant to erosion, so it provides a firm foundation for a house. So too with faith – it must be built on the solid foundation of God’s word, not the fanciful ideas of ‘false prophets’. Mk 2:1-12 Arriving back home in Capernaum, Jesus heals a paralysed man who is lowered on a mat through the roof of his house. Jesus tells him, “Young man, your sins are forgiven” (Mark 2:5). The crowds are amazed when the crippled man walks away, but some of the teachers of the Jewish law are furious and accuse Jesus of blasphemy. They point out (correctly) that only God can forgive sins. In the dry climate of Palestine, most simple houses were constructed with a flat roof where people could escape the smoke from the fire and the noise of children, or sleep outside in the cool breeze on a hot summer night (see Acts 10:9). The roof of the house would consist typically of thin wooden poles laid across more substantial crossbeams. It would not have been too difficult a task to remove these wooden poles in order to lower the crippled man through the roof (see Mark 2:4). Reconstructed houses built in this fashion can be seen today at Ancient Qasrin, a Jewish village dating from the 4th century AD near Qasrin (Katzrin) on the Golan Heights to the northeast of the Sea of Galilee (see Map 7). In addition to entering a partially reconstructed synagogue from the 6th century AD, visitors can use a hand-operated quern to grind corn and can observe an early olive press and an olive crusher. Remains of early Jewish Christian houses from the 1st century AD have been uncovered at Er Ramtaniyya near Qasrin. Lintels on the door show a combination of both Jewish and Christian symbols. These include the menorah (a Jewish seven-branched candlestick), a lulav (a palm branch), a fish (the Greek word for fish, ‘Ichthus’ represented the initial letters of ‘Jesus Christ, Son of God and Saviour’ in Greek) and the cross. 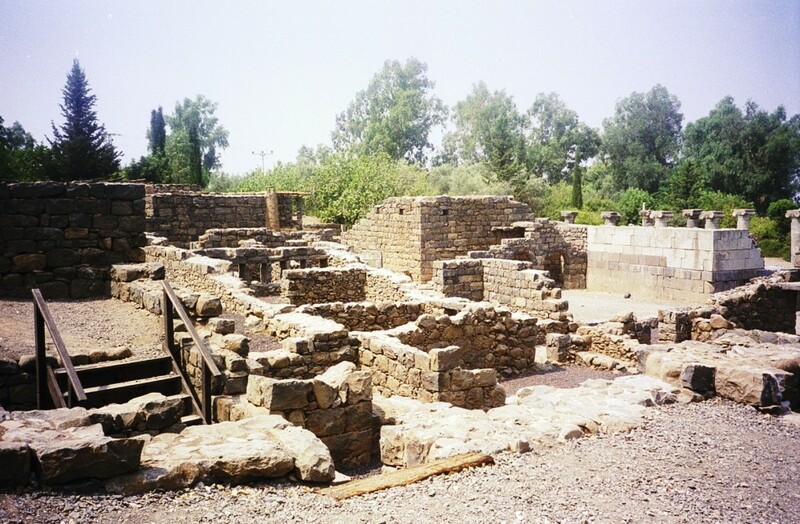 Excavated remains from the Qasrin area and nearby Gamla can be seen at the Golan Archaeological Museum in Qasrin. Reconstructed houses similar to those built in the 1st century AD can also be seen at Nazareth Historical Village, 500 yards / 500 metres south west of the town centre of Nazareth, where Jesus spent his childhood days.